As many of you know Dartmouth Business News has been publishing footfall data for Dartmouth quay for over a year now. The data shows a sharp decline in visitor numbers walking along this central street. We have been challenged many times on the validity of the data but the evidence for the fall is clear to anyone who walks that street regularly. The decline is sure to have an impact on local businesses in the lower town and although we have speculated on the reasons for the decline, what is important is that we respond to this challenge or the whole community will feel the impact. I believe this footfall data is vital to understanding the economic health of the town and I will be appealing to both the Town and District Councils to help fund a contract with Springboard for the continued supply of the data. I would estimate that this contract would cost about £3000 per annum and hope I can persuade the local authorities of the value of this information. No one should fund the footfall camera – what a waste of £3000!! Footfall is falling in most of the country’s High Streets. My home town of Stockton on Tees was voted best High Street in the country two years ago, but on a FaceBook page for the town people are always complaining about the decline in the once thriving town and market. This situation is not unique to Dartmouth. Appreciate your comment Linda but the problem I have is that we should not be measured as a High Street because we are actually a tourist destination. Tourism has grown this year because of various factors like exchange rate. St Ives has seen a 20% increase in rail passengers visiting the town so our drop of between 20 and 30% is very concerning. Our economy depends on tourism and we have a responsibility to do everything we can to sustain that economy otherwise we lose employment and therefore the youth of the town must move away to find a job. I for one do not want to live in a retirement haven! I want the town to be as vibrant as it was when we came here 20 years ago. Also the fact that high streets are declining everywhere is not a reason to stop looking for ways to change that trend. Many towns are responding with new ways of attracting people into town which the internet cannot challenge. More coffee shops so people meet socially in the town, people want to get out of the house and not sit at a computer all the time so we must look at ways of making our town center more attractive and interesting. At the same time we must built our marketing activities to let people know how great Dartmouth is for visitors. One of the ways we can manage and measure our success at doing that is to measure footfall as most of the successful town do. Successful companies are the ones with good management reporting systems so they can respond to problems before they have a negative effect on their business. 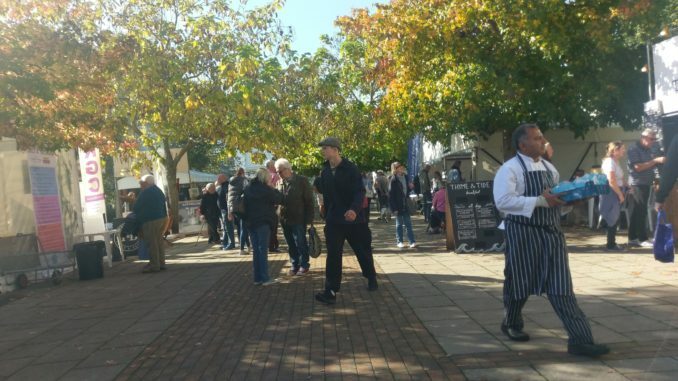 Dartmouth has seen a decline in footfall since 2008. To start with it was just 10% per annum and that is why Dartmouth businesses supported a BID (which failed). This year the decline has been over 30% at times, even though it was the best summer weather for years. I for one am not ready to stop fighting for the economic health of my town because if we do there will be effects felt by the whole community. I visit St Ives 2-3 times every year. Cornwall spends visible money on destination marketing. Something I have been banging on about for over 15 years, Devon and especially South Devon do not. Go figure ? I agree that marketing is a blind spot where South hams is concerned. The Dartmouth BID would have invested half a million in marketing Dartmouth over 5 years and could have made a real difference. Sadly you voted against it. Go figure?